WOW, what a color! Now i know where the term “orange wine” comes from. This one couldn’t be more orange, it also appears very shiny, and somehow even reminds me the color of a matured German Riesling Beerenauslese. But this isn’t a sweet Riesling. We’re talking here about a 2006 Ribolla by Slovenian winemaker Marjan Simčič. The first Slovenian wine tasted by Yours truly and also quite a unique finding considering the winemaking style and its result. The wine’s nose is shy at first, but something very chiseled, silent arises. Subtle aromas reminding cinnamon, orange blossom essence and even gingerbread but also something minty and fresh. Later a little bitterness also pokes through. On the palate it shows rather powerful, but at the same time the wine is quaffable, doesn’t show its age, and has an utterly fresh edge to it – something which is particular to more than one wine made in a “natural” way. 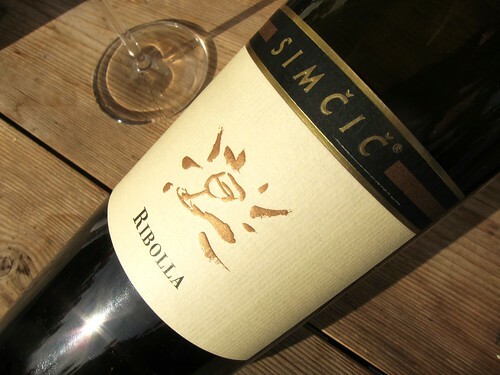 Indeed, Simčič doesn’t make use of sulfur until bottling and generally employs very traditional Slovenian winemaking methods. The wine also has a slight iodine quality, but is foremost intensely tasteful. Together with a little bitterness the iodine reminds of the typical Italian taste for bitterness – think of the many dishes with olives or artichokes. This makes sense even in a regional frame since one definitely has to mention that Slovenian and Italian winemaking are profoundly enlaced. I believe that Simčič even owns a few vineyards on Italian ground. Anyhow, this Ribolla is a deeply intriguing and satisfying wine, that demonstrates how intensity and freshness can come at once. I would see this one as a match with stronger fish dishes prepared in a Mediterranean way. Monkfish on a skewer with rosemary and olives for example. NB: let’s just quickly get back to the term “orange wine“. It describes a winemaking philosophy where white wines are macerated with a longer skin contact, extracting more of the color pigments which are contained in the skins, thus not only giving the wine more aromatics, but also a more intense color. 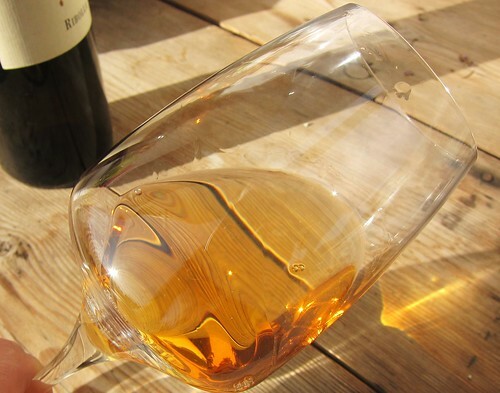 There are a couple of winemakers famous for their orange wine, especially in Italy with Valentini or Radikon. But throughout Europe more and more are experimenting with this technique, in particular also many winemakers who are part of the natural wine movement! Cool, my favorite Italian grape variety! I’ve been encountering orange wines quite a bit lately, considering my friends in Paris are really into the natural wine movement. Surprisingly, they were all quite different: one smelled intensely of dried roses, while another reminded me of changing the cat’s litterbox… including the sandy minerality :) Still, not very enticing! 1979 Aldi Alicante Bouschet Anthony Bourdain Australian Domaine Wines Baccano Ristorante Bahnhofsviertel Bierzo Birrifica Scarampola Boom Boom Syrah Boutari Cabernet & Co Carole Bouquet Château Coupe-Roses Château Haut-Brion Eiswein Geyserville Gigas Rock Oysters Grauburgunder Great Growths Heimersheimer Silvaner Jack Lamb Joachim Kaiser Kampot Pepper Kopenhagen Peter Goosens Rome Rüdesheim Saint-Joseph Sang Hoon Degeimbre Silk Bed Restaurant Weingut Salwey Wong Ah Wah's "Famous Chicken Wing"